We’d love your help. 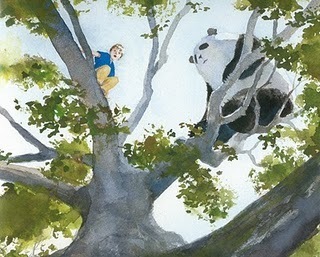 Let us know what’s wrong with this preview of Zen Shorts by Jon J. Muth. "Michael," said Karl. "There's a really big bear in the backyard." This is how three children meet Stillwater, a giant panda who moves into the neighborhood and tells amazing tales. To Addy he tells a story about the value of material goods. To Michael he pushes the boundaries of good and bad. And to Karl he demonstrates what it means to hold on to frustration. With gracef "Michael," said Karl. "There's a really big bear in the backyard." This is how three children meet Stillwater, a giant panda who moves into the neighborhood and tells amazing tales. To Addy he tells a story about the value of material goods. To Michael he pushes the boundaries of good and bad. And to Karl he demonstrates what it means to hold on to frustration. With graceful art and simple stories that are filled with love and enlightenment, Jon Muth -- and Stillwater the bear -- present three ancient Zen tales that are sure to strike a chord in everyone they touch. To ask other readers questions about Zen Shorts, please sign up. The lessons in Zen Shorts instill peace and calm. Stillwater is like a best friend, older brother, and wise grandfather all in one as he shares his knowledge. A book to come back to time and time again. This is a story about a zen philosophy toting giant panda named Stillwater. He shares ancient zen parables with the children he befriends to help them cool their jets. You totally don't have to be a kid to read this. On bad days at work (when we actually have this in stock), I like to pick this off the shelf and read it. It makes problems seem smaller, and dwelling on other people seem a waste of time. Inner peace in like, ten minutes, man! Two traveling monk This is a story about a zen philosophy toting giant panda named Stillwater. He shares ancient zen parables with the children he befriends to help them cool their jets. You totally don't have to be a kid to read this. On bad days at work (when we actually have this in stock), I like to pick this off the shelf and read it. It makes problems seem smaller, and dwelling on other people seem a waste of time. Inner peace in like, ten minutes, man! Two traveling monks reached a town where there was a young woman waiting to step out of her sedan chair. The rains had made deep puddles and she couldn't step across without spoiling her silken robes. She stood there, looking very cross and impatient. She was scolding her attendants. They had nowhere to place the packages they held for her, so they couldn't help her across the puddle. The younger monk noticed the woman, said nothing, and walked by. The older monk quickly picked her up and put her on his back, transported her across the water, and put her down on the other side. She didn't thank the older monk, she just shoved him out of the way and departed. As they continued on their way, the younger monk was brooding and preoccupied. After several hours, unable to hold his silence, he spoke out. "That woman back there was very selfish and rude, but you picked her up on your back and carried her! Then she didn't even thank you!" After reading Zen Shorts I can't stop wondering what does a slight panda accent sound like? Read and share this book because I think everyone could use a gentle giant panda in their life. I must credit my friend Jasmine who gifted this lovely keeper to me. It's the perfect birthday present for a budding watercolorist like myself. Splendid! Muth combines a tale of Stillwater the panda's budding friendship with three children with three classic Zen tales. Stillwater is a wonderful creation, so warm and cozy, so calming, so wise--yet still great fun. Rather like Zen, in fact! 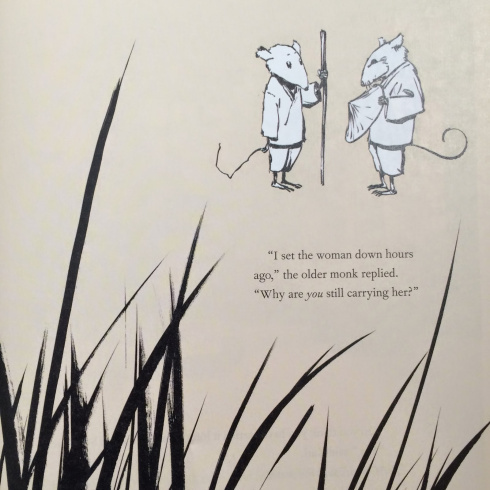 ;-> A great introduction to Zen for children, and a delightful tale anyway. I actually read Zen Ties first. I highly recommend reading this book first, then Zen Ties. Great introduction to Zen storytelling for young kids. And the paintings are beautiful. This is probably the most beautiful picture book I've ever seen. These watercolour illustrations are breath-taking. And the Zen stories are nice too. Highly recommend! You don't read this book - not in the common sense of the word anyway. You fall into it and you don't want to climb back out, much like "accidentally" falling into the ball pit at McDonald's because why should kids have all the fun. The amazingly beautiful and atmospheric water colours (done by the author himself no less) will draw you in if you let them, and they'll paint an incredible backdrop for the wisdom contained within the stories told by Stillwater, the star of t Buy this book. Seriously. The amazingly beautiful and atmospheric water colours (done by the author himself no less) will draw you in if you let them, and they'll paint an incredible backdrop for the wisdom contained within the stories told by Stillwater, the star of the book. The book'll be over before you notice (and want), but the beauty of these stories is that they can be read again and again, and never lose their value. Don't buy it on kindle, buy the hardcover so you can truly immerse yourself with the beautiful artwork. This isn't a book, it's an experience. When Stillwater the panda arrives in their backyard, clutching a red umbrella and speaking with a slight "panda accent," Addy, Michael and Karl aren't sure just what to make of their new neighbor. But as each of them find their way to Stillwater's house, they discover that this tranquil and wise bear has a gift for telling Zen tales that give them a better understanding of their own experiences. The three embedded Zen stories, dealing with generosity and not getting too attached to material posse When Stillwater the panda arrives in their backyard, clutching a red umbrella and speaking with a slight "panda accent," Addy, Michael and Karl aren't sure just what to make of their new neighbor. But as each of them find their way to Stillwater's house, they discover that this tranquil and wise bear has a gift for telling Zen tales that give them a better understanding of their own experiences. 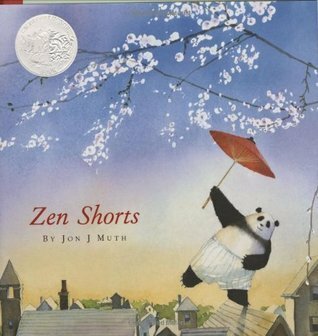 This weekend I picked up a copy of Zen Shorts by Jon J. Muth at a library book sale. What a delightful book. I still remember picking it up in bookstore for the first time and smiling my way from cover to cover. This weekend, not only did I re-read it but I passed it around to my friends to read (and smile) through. Overtly didactic, I would have liked this book less if we hadn't just had an in-depth discussion about transformative education last night in our semiotics seminar. The power of Zen stories and koans to still the mind and help people to perceive what is up close and cluttering our minds is part of transformation. Without becoming aware of broader forces and trends that work to shape us and boss us around, it can be difficult to transform. What I enjoy in a transformative experience is the having Overtly didactic, I would have liked this book less if we hadn't just had an in-depth discussion about transformative education last night in our semiotics seminar. The power of Zen stories and koans to still the mind and help people to perceive what is up close and cluttering our minds is part of transformation. Without becoming aware of broader forces and trends that work to shape us and boss us around, it can be difficult to transform. In this visually beautiful and contemplative children’s book, Addy, Michael, and Karl meet Stillwater, a giant panda who is very wise in the ways of Zen. Thus begins a book of gentle teachings and friendship. The watercolor illustrations are works of art and the taste of Zen imparted along the way will soothe the souls of both children and adults. Highly recommended. What a beautiful, serene, and enlightening book! However, I am not entirely sure how I feel about the depiction of a Buddhist monk as a panda (he even has "a slight panda accent"! ), which emphasizes the exotic otherness of a person from a different racial/cultural/religious background. This is one of my favourite ever children's books. It is wise and beautiful and gentle and profound. This is a beautifully illistrated narritive of three siblings that become friends with a panda named Stillwater. Each sibling visits the panda and the panda teaches each one a lesson. He tells them stories about his experiences to help him feel better about what is troubling them. After he tells the story, the book changes to a different, more graphic, illustration style and tells a Zen tale related to the story Stillwater had just told. It's almost like stories within a story. Each tale teaches the siblings a life lesson. I liked how the alternate illustration style highlighted these stories. Addy visits Stillwater one day to have tea with him. He tells her a story about how when his uncle got robbed one night he introduced himself to the robber and visited with him for a while. This caught the robber off guard. The uncle didn't have anything to offer him so he took off his tattered robe and gave it to the robber. He didn't want the robber to go away empty-handed. He was then sad because that was ll he had to offer him. If the robber was desperate enough to rob him, then the uncle felt he must have really needed something badly. Michael visits the panda and learns a story about how having bad luck may not always be a bad thing. It may give you good luck in the long run. When Karl visits Stillwater he brings a large load of gear for the swimming pool. His brother Michael asked him to, which upset Karl. He was so upset about this that he didn't get to enjoy his time with Stillwater. Stillwater tells Karl a story about how you shouldn't let things worry you because you miss out on other things when you do. Activity #1: It would be fun to have students break up into groups and have them act out a story that has a lesson, then the rest of the class could guess what the moral of that story was means to be. Activity #2: Students could illustrate their story in the way that the illustrator in the book did. They could share their illustrations with their classmates and tell them why they think it's an important lesson. The illustrations could be posted around the room as reminders for how to handle certain situations. 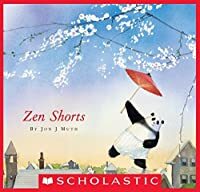 Zen Shorts is a children's picture book about three children, Karl, Michael and Addy who receive enlightening personal truths, specific to each of the children, from a gentle yet wise panda bear. 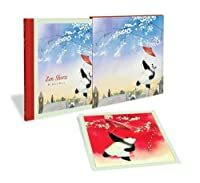 There is a sweet pattern of three's in this book; three children, three stories from Stillwater, the panda, (one for each child) and three days over which the children are given wisdom to have success over difficulties in their lives. The knowledge given to the children is rich, yet graceful, like the illustrations throughout; lovely and soothing, yet unforgettable. Educators could use this book as a read aloud in Kindergarten just for the sole purpose of pleasure and curiosity. It could also be used in first grade as a lead-in to provoking discussions about life's problems. This book could also be used at the beginning of the year in a second grade class as the introduction to a mini-lesson to provide inspiration for students to write their own example of meaningful stories they may have heard from someone in their family, and how it helped them in a specific way. This was a WOW book for me because it showed me what I'm missing in children's literature. Zen Shorts reminded me of the reality that I am unfamiliar with diverse folklore, and that I have a lot of reading to do before I become a teacher! 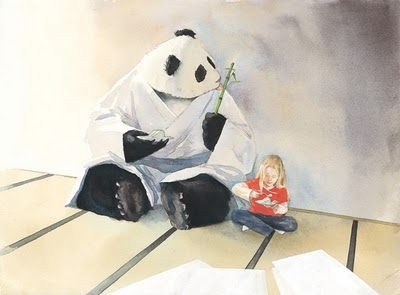 Three years before Po scadooshed Tai Lung, wonder artist/children's author Jon J. Muth won the Caldecott with the introduction of Zen Panda extraordinaire Stillwater. Muth's Zen Shorts is a beautiful piece, telling tales of love and comradeship, friendship and patience, care and giving. Three siblings find the Zen Panda and listen -- individually -- to his tales of life. They learn lessons, and so do the readers and listeners, without ever being beaten over the head with stick. And the water colou Three years before Po scadooshed Tai Lung, wonder artist/children's author Jon J. Muth won the Caldecott with the introduction of Zen Panda extraordinaire Stillwater. And the water colour art is unparalleled. So, this afternoon we finished reading our other two books, and my niece said, "Amy, I have a book we can read! It's called Zen Shorts--see, it's about a panda who wears shorts!" As entertaining as that story might have been, the story that Zen Shorts actually was was really lovely. The kids enjoyed the panda and his interactions with the kids, and they very much appreciated the pictures. It was a unique and peaceful story. For me, what drops this from four stars to three is my niece only understo So, this afternoon we finished reading our other two books, and my niece said, "Amy, I have a book we can read! 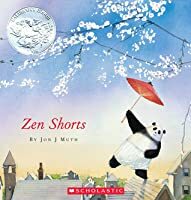 It's called Zen Shorts--see, it's about a panda who wears shorts!" This book found a place on my shelves because it is so good. I don't think of it as a children's book, but they'd like it, too. The gentle humor (in text and art), the lovable bear, the stories of wisdom ... a comforting read. I love pandas and so I just had to love this book. Very beautiful pictures and a nice introduction to Zen for kids. This book had very fun to read little storys, and really buitifull pictures. This book took me on a journey! 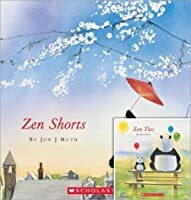 one of my favorite books are, Zen Shorts. give it a try! An adorable and tranquil book about a panda bear named Stillwater moving in to a new neighbourhood and next door to three siblings. Through stories- zen stories, he teaches each of them to look at the world in new ways. Zen is a Japanese word that simply means meditation. "Zen shorts" are short meditations- ideas to puzzle over. They have no goal, but they often challenge us to reexamine our habits, fears, and desires. Stillwater teaches Addie about material good and kindness; he teaches Michael An adorable and tranquil book about a panda bear named Stillwater moving in to a new neighbourhood and next door to three siblings. Through stories- zen stories, he teaches each of them to look at the world in new ways. Introducing the idea of zen to children. Awww that was so adorable! The pictures were so gorgeous. The stories were great; they were not meant to change lives overnight, but will give you something to think about. I would have given it a 5 star if the author put a little bit of effort in ending it. This is a good book that teaches valuable lessons. Buddhism for children and/or for adults. This is a wonderful book written for children but anyone could get the three messages from the short stories that are shared by wise Panda who is named STILLWATER! Lesson 1: Nature's beauty will always far exceed any material object. Lesson 2: Good luck and bad luck are all mixed up. Lesson 3: Let...it...go. Stillwater the panda meets three siblings and tells each the story they need to hear. Kait found it interesting and Maddie generally just likes pandas. My daughter says she now wants to read all the books in the "Zen series" because she likes "Stillwater the Story Panda."